Below are illustrations of the three methods of rubber extrusion. They each have their own advantages. Unirubber will choose the method that most efficiently and economically produces your requirements. There are a infinite number of profiles that can be extruded. The four most common are: TUBING, CHANNEL RUBBER, CORD, AND BULB SEALS . Unirubber has thousands of extrusion dies available. There is never a die charge for any tubing or rubber cord profile. 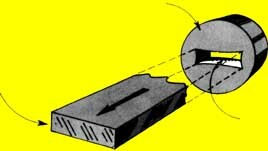 For most other rubber profiles the die set-up charge in nominal.